Time again for submitting bead quilt squares. Every year this project is sponsored by the folks from Bead & Button magazine at their annual conference. 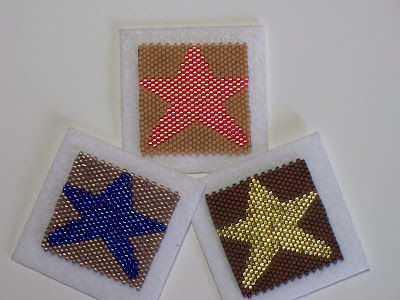 This project, which was begun by an individual, uses monies collected from the sale of bead quilts as well as other items utilizing theses squares for breast cancer research. Each year there is a different theme selected. This year’s theme is ‘Turn the Tide Against Breast Cancer’. So what may look like stars, in my squares, are really starfish. These little squares are 1 1/4″ x 1 1/4″. There’s not too much detail that can be contained in that area. Now that I have finished my squares it’s time to go on to other projects. More on those later.